This fix shows how to remove 'The disk is write protected' error for USB drives in Windows 10, so that you can easily perform write operations on the them. For security purpose, the USB drives we use can be set to allow or deny read and write attributes, according to our needs. Sometimes third-party software we use on our Windows operating systems can also change these attributes without our notice. As a results of which we may came around ‘The disk is write protected’ error. 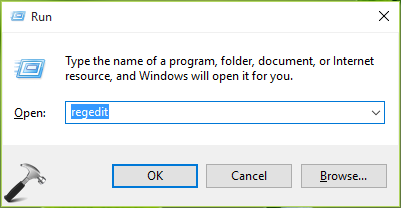 If any program you use have denied write permissions to your USB drive, you can’t perform any of the write operations such as formatting the drive, moving/creating new content to it etc. 3. Close Command Prompt window and open File Explorer to check USB drive. The write protected message should no longer appear now. 4. Set the Value data to 0 and click OK. Close Registry Editor and reboot. After restarting your machine, you will be able to perform write operations on USB drive. Hope something helps! See this fix if your USB drives are not detected/recognized in Windows 10. Command prompt said that the attempt was successful, but it’s still write protected! I followed the registry steps, but only got as far as “HKEY_LOCAL_MACHINE\SOFTWARE\Policies\Microsoft\Windows” and couldn’t find “RemovableStorageDevices” in the list. ^^ You need to create the key manually. Does DWORD need to be 32x or 64x? I have two options. I used 32x version because that is what was on the images. ^^ Go ahead with 32-bit. Something may be wrong with my drive. I can’t use it, even after the registry key was created. ^^ Is the drive working on another computer? If it doesn’t works on another machine as well, the drive might be malfunctioned permanently. I believe that the drive is damaged internally somehow… even though dropping it wouldn’t do much as it is a small and light object. this worked perfectly Kapil, thank you so much! both fixes dont work. Whats next? ^^ Check the USB drive with another system. See if it works.